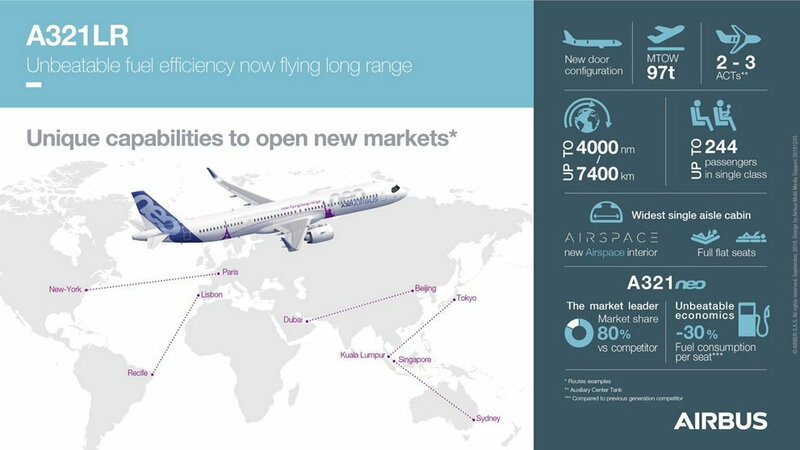 The single aisle A321LR (long range) can carry up to 206 passengers and has three additional fuel tanks so it can fly further than the standard A321’s range of 5,950km. What fun, I can't wait to try A321 long haul, oh! wait a minute.. yes I can! I always thought ETOPS was Extended Twin engine OPerationS. Is that the max density single class config? Because if it’s two class it’s starting to look like the 752 in terms of capacity and range but with modern technology which makes me wonder if it could fill the MMA role. 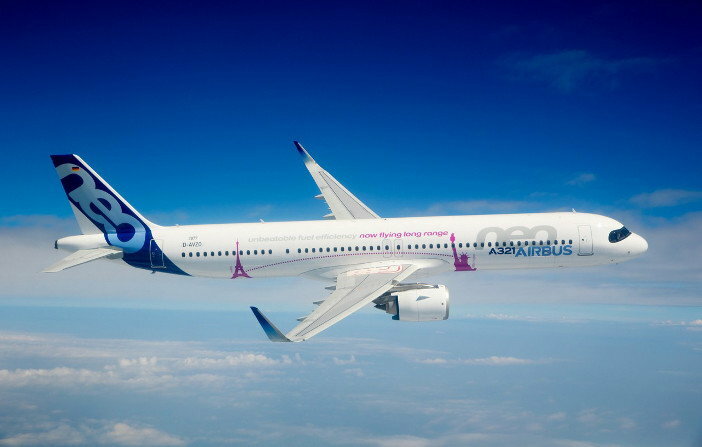 I don't like to nit-pick, but the A321NEO has not been 'certified' to 7,400 km by EASA, FAA or any other authority. It has been granted Type Certificate approval by the authorities which refers to its airworthiness, but the range is a matter under the control of the manufacturer and the operator. It can't be worse than a 10-across 777. I'm presuming that this is making it even harder for Boeing to launch its NMA. We do that distance (7400 km) in 1 duty in a 320, albeit over 2 sectors. 1 sector, same distance, shorter day! At what Mach cruising speed... M0.75? No aircraft is ever fun in a high density configuration. This is a game changer as a hub buster in a more reasonable 2-class layout at 31" pitch. I'd much rather 7 hours in this than two 5hr legs via a megahub. Look at the configs used by EY and QR in their narrowbodies, the seats are the same as fitted to the widebodies, with plenty of legroom and IFE. You don't notice the difference (in economy class). I always thought ETOPS was Extended Twin engine OPerationS. Have I got it wrong? Now officially known as EDTO. Extended Diversion Time Operations. ICAO Requirements for Extended Range Twin-engine Operations (ETOPS) have been in place since 1985, when they were introduced to apply an overall level of operational safety for twin-engined aeroplanes which was consistent with that of the modern three and four-engined aeroplanes then flying, to which no restrictions were applied. As aeroplane reliability and range improved, it became clear that all multi turbine-engined aircraft were pushing the boundaries of flight away from nearby alternates to increasingly distant ones and a review of the existing arrangements for ETOPS began. After many years of discussion about how to broaden the facilitation of international flights for all large transport aeroplanes which necessitated tracks with no close-by diversion aerodromes (or could be more efficiently routed with the use of these tracks), led in 2012 to changes to ICAO Annex 6 Part 1 under Amendment 36. This introduced the Extended Diversion Time Operations (EDTO)regime in place of ETOPS. However since then, although the EDTO regime has been widely accepted, the term EDTO has not been universally adopted the continued use of ETOPS is explicitly allowed for in Annex 6 provided that EDTO concepts "are correctly embodied in the concerned regulation or documentation". Given this flexibility, the term 'ETOPS' has been retained by the FAA and others by redefining it as an abbreviation for 'ExTended range OPerationS' rather than as previously 'Extended range Twin OPerationS'. EASA currently continues to use ETOPS as originally defined and the abbreviation 'LROPS' (Long Range OPerationS) for extended range operation by three and four-engined aircraft. As far as i know it is quite possible to configure the A321NEO LR with up to 240 passenger seats, but of course the maximum range will decrease and there might an issue with cargo for the bags. The 206 quoted is a generic 2 or 2,5 class layout. That's my understanding, too (up to 244 pax, in fact, with the revised door configuration). According to Airbus, the ACTs are operator-removable, though I can't see many airlines rushing to convert their A321LRs back to regular A321s. Impressive performance improvements, BUT even onboard shorter neo sectors (nominal duration 1:30 hrs at LH as an example) you feel that the cabin comfort becomes the limiting factor. Lavs, galleys, binspace, seat pitch in the back of the cabin (resulting in some very tail heavy a/c). This is not your DC-8 anymore. Hope airline cabin configurations will better match the aircrafts's technical capabilities. BTW: Some similar remark would be valid for the MAX. Last edited by Kerosene Kraut; 6th Oct 2018 at 08:08. No, not the max pax load. AB are quoting 206 pax as a 2 class premium W and Y cabins (like Primera Air had) which will allow that range with Aux tanks. I agree the 752 with 189-206 pax (rather than 223-235) is similar load but a bit less range offering. The latest A321neo can now be ordered with a variety of different door and exit configurations, including larger single pair or a double pair of over wing exits (not seen before on the 321) which can offer a max load of 240 pax for IT charters or a LCC. Yay! EasyJet Manchester to Dubai and back in a day....might need a third pilot? which can offer a max load of 240 pax for IT charters or a LCC. The Airbus infographic in my previous post suggests 244 (which is also the figure in the TC). That assumes the 5-door configuration: (from front to rear) Type C+ (no, I don't know what they are, either), two Type III overwing, Type C, Type C+. With the standard A321 Type C door (ahead of the wing) instead of the Type III overwing exits, the limit is 230, or 200/220 (with 4/5 cabin crew, respectively) if all 4 doors are Type C.